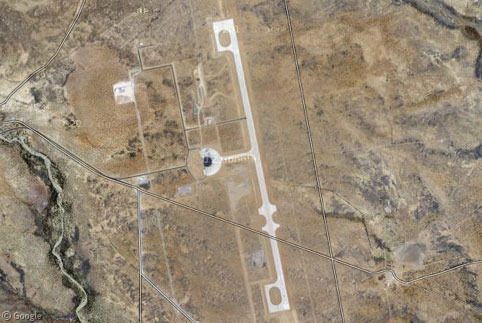 In southern New Mexico, the world’s first commercial spaceport – Spaceport America – has been built as a launch facility for private space ventures, including Sir Richard Branson’s Virgin Galactic space tourism initiative. After a couple of decades of fundraising and dealing with state and local bureaucracy, the desert location was selected and construction began in 2009 and is now close to complete, at a total cost of more than $200 million. The flat terrain was ideal for the length of runway needed for horizontal take-offs and landings of spacecraft. The runway is currently 3km (10,000 ft) long, though it will soon be extended by another 600 metres (2,000 ft). 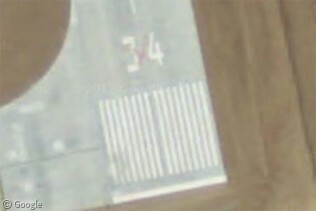 It is officially termed Spaceway 16-34, with identification numbers at either end, the red X presumably indicating that it was not operational when the satellite imagery was taken. 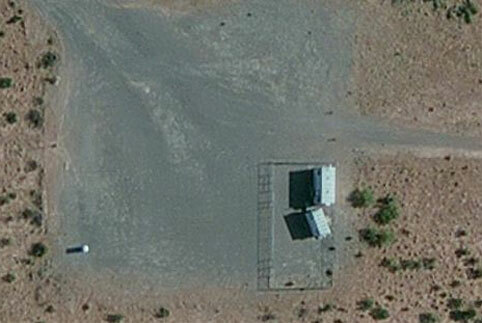 Bing’s coverage of the Spaceport is much clearer than Google’s so we’ll use it for the rest of this post. 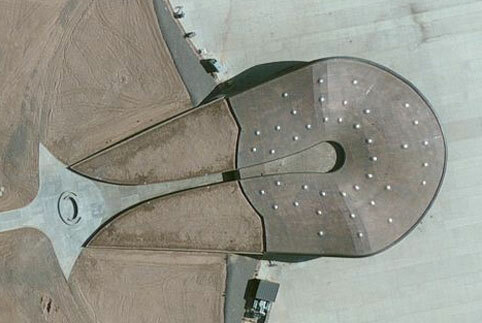 Virgin Galactic is based in the distinctive horseshoe-shaped building to the west of the runway, named the Gateway to Space. It includes hangar space for multiple SpaceShipTwo spacecrafts which will carry two crew members and six tourists, and the larger White Knight Two planes which carries SS2 aloft until releasing it for rocket flight on a suborbital trajectory which peaks at around 110km (70 miles). Several test flights have already taken place and the first public flight is expected to take place later in 2013. Spaceport Central – a terminal for visitors to the site1 – is currently in the planning phase and should be built this year to the west of the Gateway building. Space tourists will undergo three days of briefing and training before their flights, which will last less than three hours – including about 6 minutes of weightlessness – and cost $200,000. Hundreds of people have already put down the required 10% deposit2. 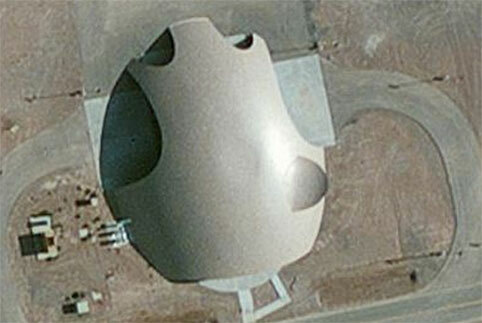 Employees of the New Mexico Spaceport Authority work in the shell-like Spaceport Operations Center which houses mission control, general offices and support services. 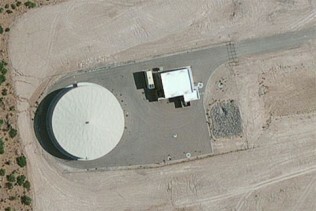 Further away from the runway are fuel and water storage depots. The fuel area provide secure storage for conventional regular fuels like gasoline and diesel, as well as what are dubbed “exotic propellants” such as liquid oxygen or nitrous oxide. The water tank holds 5 million litres (1.3 million gallons) of water for general use, and as preparation for any emergency situations. 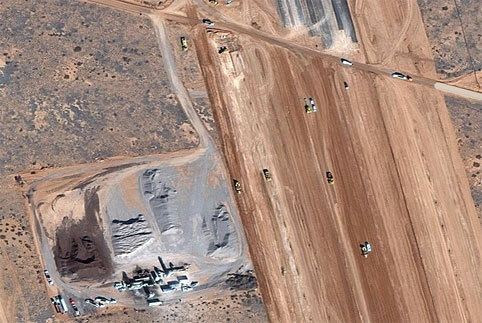 Bing even allows us to see the Spaceport under construction, with its Birds Eye imagery showing a large concrete plant and other facilities that were built on-site due to its remoteness from major cities and the sheer quantity of material needed to pave such a long runway. 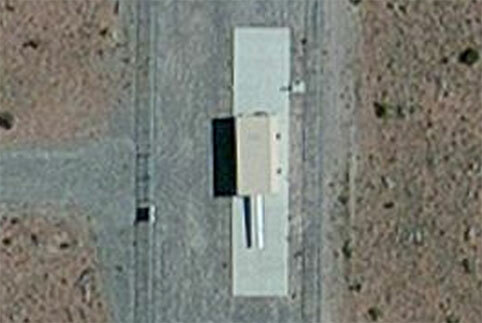 Spaceport America also has a vertical-launch facility, a short distance south of the runway. 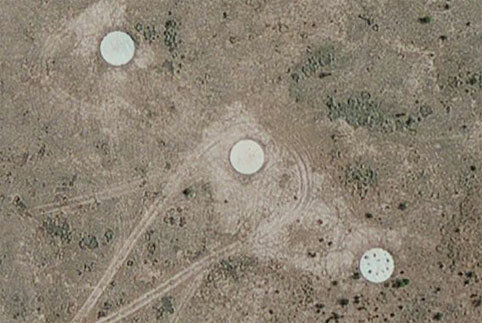 A couple of small huts make up the mission control centre. To the east is a rail-launch site – we can make out the 14m (45′) rail protruding from its storage building. Small rockets are mounted to the rail which can be inclined as needed for specific launch trajectories. While to the west are three 10m (30′) launch pads used by experimental aerospace companies, named Tranquility Base in honour of the location of the first manned landing on the moon. 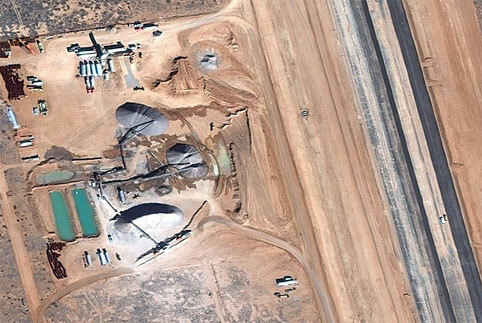 You can learn more about Spaceport America at Wikipedia and the official Spaceport and Virgin Galactic sites. YouTube has a preview tour of the Spaceport and an animation of what a flight on SpaceShipTwo should be like. Is it a treacherous hive of scum and villainy? Haha! No… I didn’t see it described that way in the marketing materials – clearly a missed opportunity! Maybe when they open the main visitor centre later in the year….